AVOID La Cienega Blvd. at Melrose Ave. West Hollywood for the next three hours due to a water main break causing a road closure. Los Angeles County Sheriff's Department - West Hollywood Station requests to AVOID 629 La Cienega Blvd. WHD due to a current traffic issue. 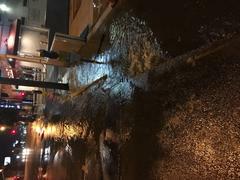 A water main ruptured near La Cienega Blvd. & Melrose Ave. South bound La Cienega Blvd. has been closed at Melrose and will require a detour of traffic for the next three hours.